The word hype is thrown around a lot these days when talking about video games. But few games have reached the heights of hype that No Man’s Sky, especially considering the small size of the team at Hello Games. This dozen or so group of minds have been working at a fever-pitch rate to deliver what may be considered their magnum opus. For many gamers, the release of No Man’s Sky has been a long time coming. So has all the buildup of gargantuan hype been worth it? In a word, yes. Everything that Hello Games ever claimed to be in the game appears to be in here. That’s a very important distinction that some people may have a difficult time understanding. The unfortunate side effect of all the hype that No Man’s Sky received over the past three years since its explosive introduction to the world at E3 2013 is that it couldn’t possibly live up to everyone’s expectations. We live in a world of entitlement; some people feel that No Man’s Sky is their game, and that it should fulfill some grand vision of theirs. The only problem with this way of thinking is that this has always been Sean Murray’s vision, as has been his right as the developer. The game released when he was happy with it. It’s his (and his team’s) galaxy; we just get to play in it. And play you will! Without giving anything major away, the game begins with you in dire need of supplies. There’s little instruction, and you must act relatively quickly if you hope to survive the night. It is here that you learn how to collect resources, which parts do what on your ship, and how your multi-tool works. It is also during these first few minutes that the game has likely either sold you on its premise, or fallen flat. A typical hour in No Man’s Sky can go a little something like this: As your hyperdrive cools down, you begin to descend on your target planet, when suddenly a warning signal appears on your ship’s HUD. A pirate starship has scanned your vicinity, and detected the precious cargo on-board your ship. Your speed is such that you can likely outrun them and land safely on the planet. However, you did recently upgrade your ship’s weaponry, and naturally you’re eager to test out your new toy. So you reverse course and get ready for a fight. You line up your reticle, pull the trigger, and hit your target dead-on. But your enemy is well-armed, and came in a group of at least three; you’re hit multiple times, and before long your shields are down. Bringing up your inventory mid-fight, you recharge your shields using materials acquired from the last planet you were on, and continue the fight. One fighter down. Now two. The third comes in from behind, but you flip on the reverse thrusters and quickly take care of him. Unlucky pirate number four is off in the distance, firing at an innocent merchant vessel, perhaps hoping you don’t see him. Fat chance; a few photon cannon shots easily take him out. Your bravery is rewarded by the merchant whose day you just saved. Now, time to descend to your original target, in search for some ruins. Just before you break into the atmosphere, you notice a small orb in the upper-left corner of your vision. It’s a moon! The last time you landed on a moon, it had the most absurd landscape and things to upload to Atlas, the central database of information which pays you for documenting your findings. Oddly, no wizards though. Anyway, you decide to take your chances on this new moon first. Changing course, your excitement is quickly turned into disappointment as your visor confirms on its readout when you touch down: It’s a barren moon, devoid of all life, and nary a sentinel to be found. You lazily survey your surroundings, when you notice a few odd shapes jutting out of the ground. A closer inspection reveals a mountain of gold! Other rare minerals are deposited in similar-sized mountains. A grin spreads across your face, and you gleefully fill up your inventories with as much precious metal as you can carry. A distress signal is picked up by your ship, but you pay no mind to that right now; you just hit the motherlode, and you have a space station to get to! No Man’s Sky feels like a hard sci-fi game, without actually being all that tough of a game. Most challenges outside the immediate statistics-based ones that you are constantly being rewarded for completing will be ones that you set yourself, in an unofficial capacity: buy a 1,000,000+ unit-priced starship, for example, or discover 100 percent of all flora and fauna on a planet or moon. If you’re the type of gamer who likes creating their own challenges for yourself, it’ll be hard to run out of things to try in No Man’s Sky. On the flip side, those who require a structured game, which floods your UI with objective after objective overlaid on top of a nice, neat map, will not enjoy No Man’s Sky. Part of the beauty of the unstructured nature of this and other sandbox games is that you can do whatever you want within the game’s mechanics; if this lack of structure infuriates you then this title will do little to convince you. It’s okay that some people aren’t wired for a game like this. I know I’ll spend hours on end mining in Minecraft, usually to Daft Punk’s Random Access Memories album, just the same as I can spend even more hours in this virtual galaxy, collecting countless minerals, perhaps even to the same soundtrack. There is an ultimate goal in No Man’s Sky, just like there is in Minecraft, but it is entirely optional, and once complete, the game continues on anyway. That being said, the crafting on offering here is a little underwhelming. Due to the large size of the galaxy, the inability to build anything on planets is understandable but still stings; you also cannot craft ships, something I feel is a missed opportunity. You can craft technologies that you find for your exosuit, multi-tool, and ship, and weighing the pros and cons of each is a fun balancing act which takes some time to get just right. No Man’s Sky also includes a trade economy, which has fluctuating prices and a handful of factions. Through repeated interactions and exploration of ruins and monuments, you can gain or lose standing with any of these factions, which can unlock more fruitful conversations with members. You learn words in each faction’s native tongue, which can help to decipher some conversations and computer terminals later on. Any time my visor points out an ancient ruin, I make a beeline towards it, ever on the hunt for more knowledge. The lore would feel right at home in a choose your own adventure sci-fi novel, and plenty of fans will soak it all up. 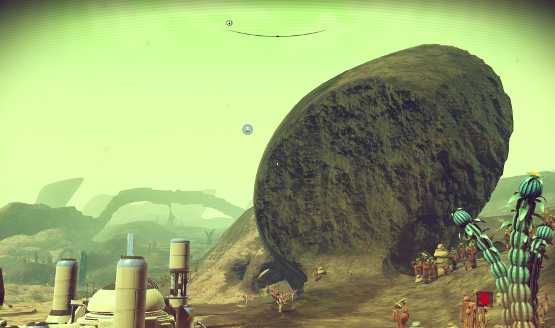 From just a technical standpoint, No Man’s Sky is incomprehensibly large. With the much-touted 18 quintillion+ planets available to explore, distances are indeed vast. I began my journey some 176,000 light-years away from the center of the galaxy, a number that grew only a little smaller with each successive hyperspace jump. Just a heads-up: until you upgrade your starship enough, or purchase one that has already been upgraded, your progress will be slow. Sure, some people will power through the game and reach the center in their first week of playing, but there is genuinely no rush; because the game can be played offline, whatever is at the center of the galaxy can wait as long as you need to see your fill of this mindbogglingly large galaxy. No Man’s Sky tends to look quite nice, most of the time. Once the game is loaded, there are no loading screens. Jumping between star systems includes a trippy animation and accompanying music which sounds straight out of the sci-fi classic Bladerunner. But move at even sprinting speed on a planet, and you’ll no doubt see some pop-in of textures. Destroying the environment can occasionally result in some weird graphical glitches as well, though these are less common. Still, some of the most wonderful moments to be had in No Man’s Sky occur when you slow down and take in your surroundings. There’s beauty to be found in these procedurally-generated landscapes, from lush tropical jungles to arid deserts, and everything in between. I think I’ve taken a screenshot at every planet and moon that I’ve touched down on, something I plan to do every time I play the game. The soundtrack is also procedural in No Man’s Sky, and usually matches whatever is going on in your game. It’s equal parts majestic, relaxing, dramatic, and even a little frightening from time to time. You are almost alone in your adventure for most of it, and the game’s music reminds you of that. Coupled with the roars of some of the larger fauna you’ll encounter on your journey, and you can completely lose yourself in a world if you have a good set of headphones on. So No Man’s Sky isn’t flawless. It’s probably not for everyone. Then again, No Man’s Sky is exactly as described by the eccentric Sean Murray. If you’ve ever dreamed of being a cosmonaut, of starting with practically nothing and amassing a fortune, of becoming a notorious space pirate, or had any other of the countless sci-fi fantasies out there, this is probably the game for you. 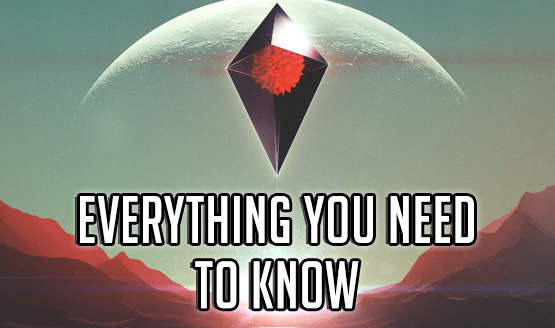 Now, those fantasies might not play out exactly as you’d have hoped in No Man’s Sky, but this is a game that begs those who put in the time to come back just once more and see what lies just over the horizon. If this game is right for you, you won’t be able to put the controller down. 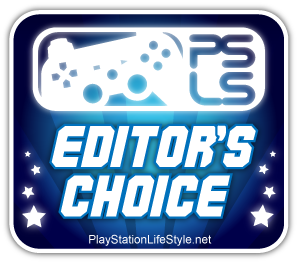 No Man’s Sky review code provided by publisher. For more information on scoring please see our Review Policy here. ...which may not be what you expect. Turning in discoveries can be a little tedious.